Sharron Parker received an undergraduate degree from Duke University and a masters degree from the University of North Carolina at Greensboro, studying education, art, and interior design. She continued her studies in textiles at Penland School of Arts and Crafts and Arrowmont School of Arts and Crafts. In 1980 she began working in handmade felt, after seeing 2,500-year-old felts from an archaeological dig in Siberia. The simplicity of the process – working combed wool in hot water until the fibers lock – provided the chance to work spontaneously and experiment with a technique few contemporary artists were using. Over the last 32 years, Sharron has developed her own approach to the medium, creating wall pieces with an emphasis on color and surface texture. 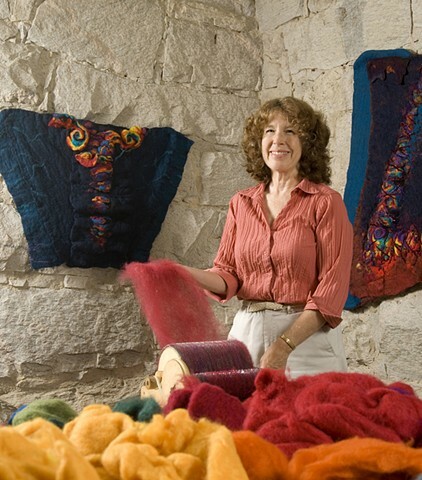 She has exhibited throughout the United States -- at Crafts National in Pennsylvania, Textile Arts International in Minnesota, the Atlanta International Museum of Art and Design, etc. – and had recent solo shows at Methodist University and the Maria Howard Arts Center in Rocky Mount. International exhibits have been in Armenia and Turkmenistan, arranged by the Art in Embassies Program of the State Department.